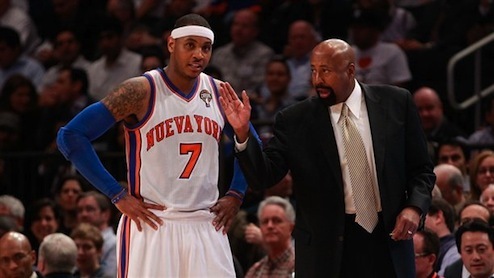 Star of the New York Knicks Carmelo Anthony recently came out in support of the Knicks Interim Head Coach Mike Woodson. The rejuvinated Knicks are 18-7 since the defensive minded Woodson took over the Head Coaching duties with the team. After ranking as one of the worst defensive teams in the league during former Head Coach Mike D’Antoni’s time, Woodson has inspired this version into a top 5 defensive team. It is no coincidince that Tyson Chandler joined the team over the past year as the defensive leader averaging ten rebounds and a block and a half per game. But it is not just the difference in the X’s and O’s that is making an impact with the Knicks. For much of Anthony’s career, he has been considered a prolific scorer with the desire to be just that; dissappointing many of his biggest fanantics who believed he could be a top three player when he entered the league. Inspiring veterans can be a difficult task. Just ask Woodson. During his stint in Atlanta, Coach “Woody” was able to turn around a middling Hawks franchise that had become a bottom dweller in the Eastern Conference. Under Woodson, the team became a perrieniel playoff team, but many viewed the team as one that lacked competitive desire. A trait that many attributed to the head coach. Some viewed this pairing as flawed. Some saw Anthony as too reluctant to play defense and Woodson incapable of handling the New York market. However in a season where the Knicks had a former NBDL point guard set Manhattan ablaze with Linsanity, suddenly putting forth more effort on the defensive wasn’t that difficult of a request. Woodson broke through and was able to get from Anthony, what future Hall-of-Fame Coach George Karl could not. While Woodson was fired in 2010, he didn’t stay on the scrap heap too long, joining the Knicks in 2011. Woodson and Anthony have both dealt with their share of doubters, however each has found something unique in one another that can get them both to the next level. Don’t tell the Miami Heat that!